iPhone vs. iPhone: Which Network Can Satisfy Your Need For Speed? AT&T says it has worked hard to improve its much-maligned 3G network over the last eight months--erecting hundreds of new cell towers, using better-performing wireless spectrum, and souping up its cell sites across the country--and the results of our latest 13-city 3G network performance tests suggest that the network has indeed undergone a drastic makeover. After registering the lowest average download speeds in our 3G performance tests last spring, AT&T?s network turned in download speeds that were 72 percent better than the numbers from eight months ago; in our latest tests, AT&T's download speeds were 67 percent faster on average than those of the other three largest U.S. wireless providers--Sprint, T-Mobile, and Verizon. 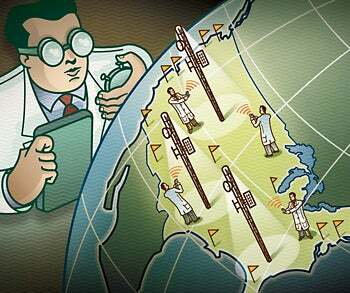 In our tests last spring, AT&T posted an average download speed of 812 kbps (kilobits per second) across 13 cities. In our tests conducted in December 2009 and January 2010, AT&T?s average download speed increased to 1410 kbps. AT&T's download speeds in New York City were three times faster in our latest tests than in our tests last spring; in San Francisco, the AT&T's download speeds were 40 percent faster. The AT&T network?s reliability improved dramatically, too: Last spring, PCWorld testers obtained a usable broadband connection with AT&T only 68 percent of the time. In our latest tests, testers connected to AT&T successfully in 94 percent of their attempts. Verizon Wireless, which turned in the best all-around performance in last spring's 3G network testing, and Sprint, which finished a close second, both continue to perform well, according to our latest test results. Our tests found that Sprint?s network delivered download speeds nearly identical to those we measured eight months ago in the 13 test cities; Verizon?s download speeds decreased by 8 percent overall. In the past year, Sprint and Verizon--like AT&T--have seen a marked increase in the number of 3G smartphones that rely on their networks. Our speed results suggest that Sprint is upgrading its network capacity fast enough to meet the demand, while Verizon may be having trouble keeping up. Nevertheless, both networks? reliability (the likelihood that a user can connect to the Internet at a reasonable speed) improved in the most recent tests over how they fared last spring. We tested the T-Mobile 3G network for the first time in December and January, and found that it supported download and upload speeds that were competitive with Sprint?s and Verizon?s in most of our test cities. In one city--New York--T-Mobile?s network even delivered download speeds that are usually associated with 4G networks. Before getting into the details of our test results, a few words about the testing and the data. During December and January, PCWorld and our testing partner, Novarum Inc., tested the download speeds, upload speeds, and network dependability of the AT&T, Sprint, T-Mobile, and Verizon 3G networks from 20 locations in each of 13 U.S. cities. Altogether we ran more than 51,000 separate tests covering 850 square miles of wireless cell coverage servicing 7 million wireless subscribers (see ?How We Do the Testing?). At each testing location, we connected to the 3G network via both laptops and smartphones. The laptop tests accurately measured the capacity and performance potential of a given network, while the smartphone tests approximated the real-world connection speeds users of these popular devices might experience, given the less-powerful processors and 3G radios that the devices contain. The charts list the cities in the leftmost column; moving rightward across the chart, you can see the speed averages and reliability scores in that city for each of four 3G wireless networks. Speeds are expressed in kilobits per second (kbps); the figure for reliability represents the percentage of the total number of 1-minute tests we conducted of a given carrier's service during which the service maintained an uninterrupted connection at a reasonable speed. Click on the chart thumbnail at left to see the detailed results of our laptop-based testing of the Big Four 3G wireless networks (AT&T, Sprint, T-Mobile, and Verizon) in 13 U.S. cities. Click on the chart thumbnail at right for the detailed results of our smartphone-based testing of the Big Four 3G wireless networks in 13 cities. Because we couldn't test every city in the country, we chose 13 that are broadly representative of the rest: Baltimore, Boston, Chicago, Denver, New Orleans, New York City, Orlando, Phoenix, Portland, San Diego, San Francisco, San Jose, and Seattle. Because wireless signal quality depends to a large extent on variables such as network load, distance from the nearest cell tower, weather, and time of day, our results can?t be used to predict specific future performance in a specific area. Rather, they illustrate the relative performance of 3G service in a given city on a given day. Each speed number possesses a margin of error of plus or minus 5 percent.